In this article, we'll look at what successful realtors, real estate investors and profitable homeowners have learned about increasing home value in the years since 2008. We’ll see how they’ve identified crucial features that savvy homeowners are seeking (and are willing to pay extra for). We’ll learn how selling the emotional value of peace-of-mind can help increase your home’s value as much (if not more) than any physical attribute. I’ll also mention some improvements to avoid, and ways to get the most return on your investments. There are plenty of things you must do before you want to start showing - like repainting, replacing old carpets, tidying up, etc. - but the points listed in this article are chosen because they can add real dollars to your selling price. Your situation calls for your own custom solution, so take these points as best-practice guidelines, and use the links to find more resources that will help you make the right investments. Here are 12 strategies to increase your home's value when you list it for sale. When you’re preparing to sell your home, you’ve got to start thinking like a business and believe that your home is your flagship product. What's your ideal sellign price? What's your timeline? What’s your Value Proposition? Why would someone want to buy your product? What areas of your product need improvement, and where can you get the greatest return on investment? Questions about these Business Topics? Ask Michael about them in an email. When you’re planning, consider changes that fit with the overall style of your home, and won’t force you to re-do too much (think about your neighborhood as well, and make sure your changes fit with the atmosphere of your surroundings). Again, just like a business, don’t customize your product too far or you’ll run the risk of narrowing your potential market down too much, which could sacrifice your selling position. So keep your upgrades humble, and don’t splurge on things like ultra-fancy appliances or lighting fixtures. The majority of people don’t see them as value-adds. Consider your self the "CEO of Selling Your House, Inc." and write yourself up a "mini business plan" that organizes your strengths and weaknesses, competition, timeline, goals and list of improvements to make/consider/omit. Keep a journal and timeline of your improvements, and save things like receipts/invoices, contractor’s business cards, quotes, before and after pictures and more. The potential buyer can look at your documents (or, if you really want to add to your selling price, you’ll create a storybook of your improvements - ask us for help!) and actually see how much value they’re getting by buying your house. It’s not so much about matching dollars invested to dollars on selling price, but more about creating a product that has significantly more assets than liabilities. 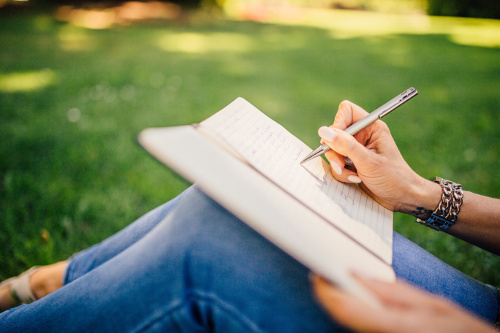 Your journal or storybook is a perfect way to document what kind of assets are in your house. It also shows that you’re on top of your game and you’re a trustworthy, dedicated homeowner and seller. Now you’re hitting both the rational and the emotional sides of your buyer, and they’re excited about the deal they’re about to get. The goal here is to increase your home’s value by a (much) greater amount than what you invested into it. To meet this goal, you've got implement changes that match with what your target market wants. Every city, town, street and neighborhood is different, so use your best judgement when thinking of your situation. (You may want to consider asking someone who's recently moved about the kinds of things they were looking for as they shopped). Here's a shortlist of items that homeowners are looking for, and you can check out this report for more details. Of more than 120 features rated as “essential/must have,” “desirable,” “indifferent,” or “do not want,” a total of 11 are wanted (i.e. 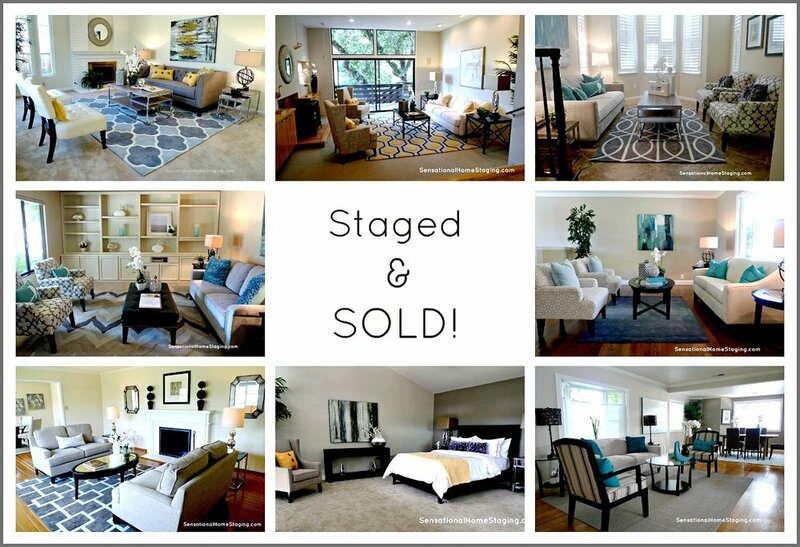 rated essential or desirable) by 85 percent or more of home buyers. 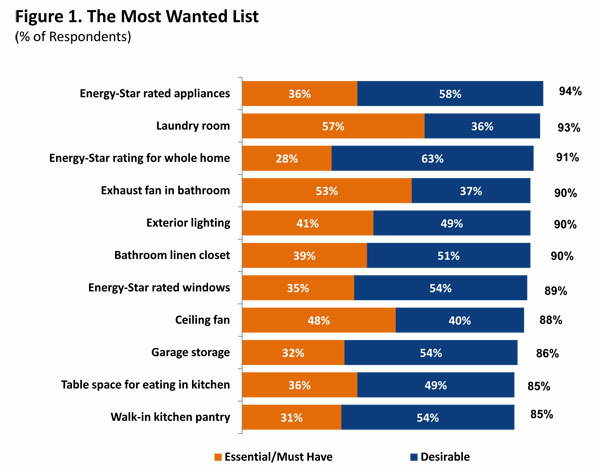 This “most wanted” list shows buyers are most interested in two themes: energy efficiency and organization/storage in their homes. Energy-star rated appliances and windows, as well as a laundry room and garage storage, are wanted by the vast majority of home buyers. See the 11 items in the graph below. For better or for worse, the rise of home and garden shows (along with that thing, the Internet) have made home buyers more educated, picky, and imaginative than ever. They’ve got 400 Pinterest boards, 200 YouTube videos and a week’s worth of TV shows saved on their smart TV. I’m not saying you need to create an ultra-modern all white home with a waterfall and flamingos in the backyard. But, taking some tips from those shows can really help (it’s all about putting yourself in your customer’s shoes). Think about how you can stage your home - inside and out - to make it look as attractive as possible. Can you arrange furniture to maximize the space in your room? Would removing a few extra odds-and-ends declutter your space and make it more open? Think about little details like this (even if that's not the way your home usually is - you've got to market to your shoppers). These potential buyers are scrutinizing everything. Little things like fingerprints on doors and windows, weeds in the garden, discoloration on anything that’s white - all of these add up to affect people’s purchasing decisions. Remember - people don’t always look for a reason to buy as much as they look for a reason NOT to buy. Realtors and sellers alike will tell you that home buyers spend a majority of time looking at the kitchen. 1. It’s likely to be the place where they spend the most amount of time. 2. There’s so much to think about when it comes to style, quality, appliances, plumbing, working space and more. So it’s important to make sure you get as many details of your kitchen right as possible. Especially when you consider that the price they’re willing to pay correlates with how much they love the kitchen. This doesn’t mean you have to spend a fortune - and it doesn’t even mean you have to spend money now. The following overview is pretty brief. I could write a whole post just on remodeling your kitchen to improve home value - so these points below provide a helpful starting point. Are the cabinets an asset, a liability or a non-factor for your potential buyers? Do you need new ones, or could you just have them resurfaced or painted? Chances are, amazing cabinets aren’t going to allow you to boost your selling price by a ton, but having less than ideal cabinetry will raise flags for your buyers, and give them reason to pause. Sometimes small fixes, like adding soft-close hinges (which you can install yourself, and are quite inexpensive), updating the knobs and pulls, or even removing some cabinet doors and substituting glass or fabric can be inexpensive improvements that eliminate doubt from your buyers’ minds. Appliances - How new are you units? Do your potential buyers have to worry about shelling out a few grand for replacements next year? You’ll want to be sure your buyers feel confident with the appliance package, since it can be expensive to repair or replace faulty units. Time your appliance package purchase with a huge appliance sale so you can get top-of-the-line products at regular pricing. You might even be able to talk with an appliance store that does home remodeling to see if you can get a deal. Lighting - You don’t have to spend a lot on new fixtures to make improvements in your lighting. Often times the simple effort of installing energy efficient bulbs, deep cleaning the fixtures you have, and documenting your updates along with any electrical inspections will remove any red flags from your potential buyers’ minds. What if you left them with a variety of spare light bulbs that matched the different fixtures in your home? Plumbing - What does your sink say about the kitchen? You might not need to replace it if you can clean it up to look new and remove any scratching or discoloration. If you do need to replace your sink, go for something of quality. Don’t necessarily think spending $x000 will allow you to raise your price by $y000 - think instead of how you can make the whole space as attractive as possible. Installing a brand new farmhouse sink, or something that fits well with your kitchen will give the space a greater appeal and will help remove doubts from your buyers’ minds. 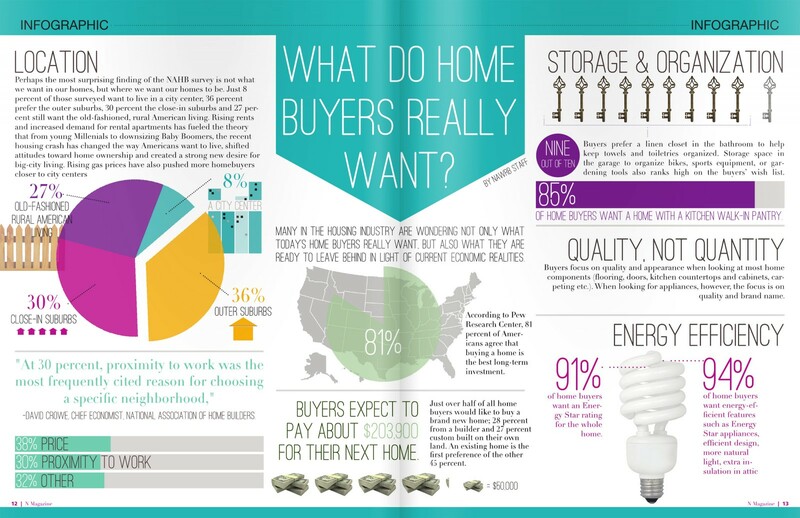 Home buyers are willing to pay more for more spacious kitchens and living rooms. As the kitchen continues to be the hub of activity for families of all styles and sizes, open spaces are highly sought after because they give homes a better flow and can make small floorplans feel much larger. You can remove non-structural walls, create half-walls in the right spaces, or remove the kitchen island if it will markedly improve the amount of open space. While knocking down walls might seem like an extreme route, this type of project can return huge dividends when done right. For a few thousand dollars (or likely much less), removing a wall and joining two rooms will recreate the entire feel of your house. It will make it feel like a home with more square feet than what’s actually there. "Right now buyers want a wide open floor plan, the living room right off the kitchen. They are into big spaces," says Kristin Wellins, Senior Manager of Program Development for ERA Real Estate. We did a project for a homeowner in Rochester, New York and put this practice into use. They wanted to increase the space of their kitchen and dining room. They also plan to move, and wanted to increase their home’s value. Now they have a modern home layout in a century-old home. Take a look at the completed project and mid-project photos. Make sure your buyers know that the changes you’ve made haven’t created any more work for them (and will even save them time). A great example is countertops. People love granite and it can pack a punch when determining a list price. But did you know granite stains, requires time-intensive sealing and treatments, and can even absorb bacteria? They require intensive upkeep and can chip. Compare that to quartz, by a maker like Cambria. Quartz doesn’t stain, and it doesn’t require any sealing or treatments. They’re incredibly durable and will last longer than comparable natural stone countertops. Cambria quartz is non-porous and non-absorbent so you don’t have to worry about any contamination (Cambria even makes countertops that have the highest food safety rating). Plus, have you seen the kind of style and quality you can get from quartz natural stone countertops? By investing in a high-fidelity, maintenance-free quartz countertop that adds style and substance to the kitchen, you can feel confident about upping your asking price. Options like luxury vinyl tiles, or laminate wood flooring give a kitchen, bathroom or hallway an entirely new feel. Not only are their dozens of stylish options available, they are easy to maintain with little upkeep required, and last for years with minimal wear and tear. With an investment of under $900, homeowners can comfortably add $2000 or more to their selling price. Now, take a look at your current flooring situation. You may not need to even make this investment if you feel that your current floor isn’t detracting buyers. But, if you’re questioning whether or not if your current floor is a value-add or a liability, talk with an interior designer or your realtor to get their advice. If it is a potential detraction, consider this investment, because your potential buyer isn’t just worrying about the color and feel of your current floor - they’re wondering who’s going to redo it, how much is it going to cost, how long’s it going to take, when are they going to have time to pick out material, etc, etc, etc. Okay, maybe that conjured up the wrong image. What I mean to say, is make your bathroom appealing to your potential buyers. Often times, very small fixes can return huge dividends. Again, assess your current situation and try to identify any major weaknesses that will make potential buyers give you the “We’re going to take some time to think about it” speech. Fix the big problems first. And make the investment to fix them well, because the last thing you’ll want to do is spend on home improvements without being able to increase your asking price. Get a new toilet and new faucets. Fix aging grout or moulding and any discoloration. Consider a shower door upgrade if yours is looking less-than-stellar. How’s the lighting? Is the fan noisy and unclean? Let’s be real here - no one’s going to say, “Well, they did get a new toilet so that price seems fair,” but that’s beyond the point. While small fixes like these are hard to quantify 1-to-1 return (e.g. I spent $X so I can raise my price by $Y), continually improving the quality of your overall “product” will justify an increased asking price. Instead of thinking about how much you spend on small bathroom upgrades and how much you can add to your selling price, ask yourself these 2 questions: can potential buyers check off the “Bathrooms-are-all-good-and-don’t-require-any-more-work” box? And if they can, how much is that peace-of-mind worth? Potential buyers are going to take a look at the yard, garden and outdoor areas while they’re shopping. Do as much as you can to fill out the garden and removing anything that’s unwanted. You don’t need to make major investments in landscaping, but eliminate any potential red flags for buyers like dead plants or trees or unsightly weed gardens. 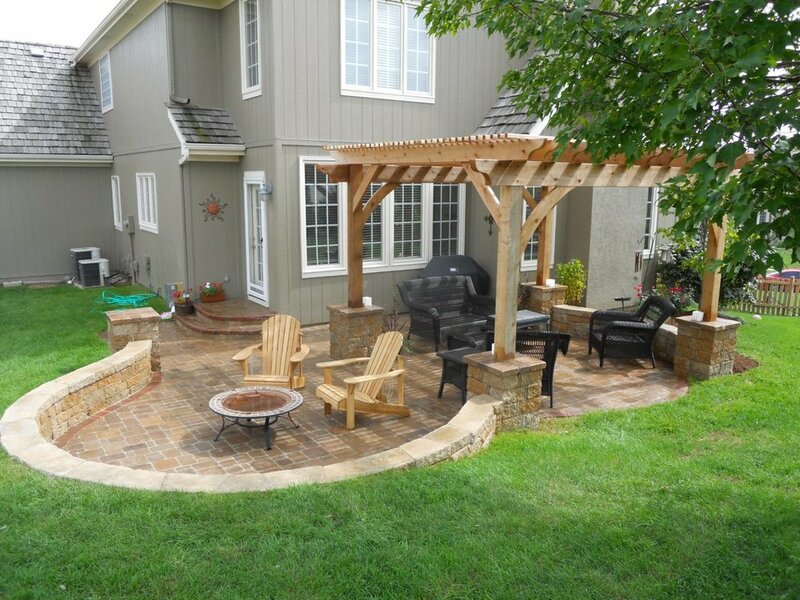 Check the integrity of your wood, composite or stone patio and make sure it isn’t perceived as a liability. Pressure-wash it to remove any moss or embedded dirt. PRO TIP Want to make your potential buyers feel warm and fuzzy inside? Offer to reseal their driveway after they move in, so they can start their new chapter with brand new blacktop. Will this help you add thousands to your asking price - no. Will it help your potential buyers get to YES faster - it certainly doesn’t hurt. It’s a nice addition to your peace-of-mind offering. Many of the home improvement decisions you will make are stipulated by your move/sell timeline. If you’re already in the process of selling, stick with some improvements that are low-intensity in both time and money. Think refresh rather than replace. If you’re still a few years out, you can realistically look to make significant improvements and live in an upgraded house until you move for pennies on the dollar. Think about it this way - if you put $20,000 into your kitchen and are able to increase your home’s selling price by $15,000 (and those are very realistic numbers), you can live in a brand new kitchen for somewhere close to net $5000 and see about 75% of your investment returned back to you. Here’s a quick list, along a few more in an article that will give you more detail. The infographic above also touches on some of these points. You won’t be doing yourself any favors by overdoing a renovation and making your home’s value and style far beyond that of the neighborhood. Furthermore, if you shell out a ton of effort on the kitchen, but don’t complement the work with upgrades to the rest of the house, your potential buyers might not perceive the upgrade as a huge value. Following the previous point, high end upgrades on things like appliances may turn-off potential buyers. A professional grade stovetop with a stainless steel hood and 9 burners is probably awesome, but might only appeal to a small subset of the market. It will probably look amazing for the first season, but that landscaping job will turn into a time-consuming and expensive liability for the new homeowners. If you do spend money on landscaping, make an effort to “wipe the slate clean” for the new owners - meaning they’ll be able to do most of what they want right out of the gate, and you’ve made their job easier. You're just sitting on a pile of cash! Did you know? Get exited about making more money when you sell your house! As you consider these strategies, picture your home and think of any points of weakness. Think of your potential buyers, and their decision-making process (price is important, but these folks are buying a home, so there’s much more than price). Think of the old adage: "a chain is only as strong as its weakest link.” Are there any areas of your house dramatically bogging down the rest? Plan out your home remodel roadmap, and focus on choices that will give you the greatest return on investment. Consult this guide, use the links, and do some research on your own. Talk to people who have recently bought a home or are currently shopping. Ask them what matters to them, and what doesn’t.